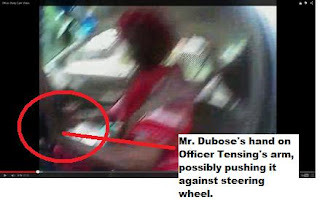 3:22 time mark -- "This is conclusive evidence that Prosecutor Deter's assertion that "Rather than being dragged by the moving car, Deters said, Tensing "fell backward after he shot [DuBose] in the head."" Did you mean to add "is incorrect" at the end? Sentence needs an evaluation of Deter's assertion. @Mmatters Yes...thanks!...added the "is incorrect". Very late in the evening when writing this up. Are you asserting that Tensing was "dragged" for .5 seconds and therefore had to execute Dubose because in that half second Tensing feared for his life? "...Officer Tensing stated that he almost was run over by the driver of the Honda Accord and was forced to shoot the driver with his duty weapon (Sig Sauer P320). Officer Tensing stated that he fired a single shot. Officer Tensing repeated that he was being dragged by the vehicle and had to fire his weapon..."
I'm asserting that the evidence shows he was dragged. I'm asserting that a final formal forensic analysis will determine if the car was moving before any shot was fired. I'm asserting that most people don't shout "Stop, Stop" as instructions to a vehicle operator if that vehicle is already stopped. They typically do that if the vehicle is moving and they want it to stop. The only evidence you're showing that Tensing was dragged comes from his own statement and Weibel's statement. Weibel was not present when the "dragging" occurred. Again, are you claiming that the evidence shows that Tensing had no choice but to execute Dubose because Tensing was being "dragged" by the car for HALF A SECOND? How can someone be dragged by a car for .5 seconds? Could Tensing had traveled using his feet? A police officer is sometimes required to literally make a potentially life or death decision and act upon it under rapidly evolving and dynamic circumstances involving a variety of mental, physical, and emotional aspects of the deadly force experience. Because the act of using deadly force is so personally impacting, the descriptive phenomenological psychological method was used in this study to provide a qualitative, holistic and personal viewpoint from the officers’ perspective in their lived-experiences. Three city police officers were interviewed and each gave a descriptive account of their deadly force experiences. This is a wide angle camera. Distances are exaggerated. Everything looks farther away than it really is. I know this because I have a wide angle dashcam and I have reviewed footage of incidents in which another car cut in front of me dangerously close on the freeway. In the video, it looks way farther away than it really was. Tensing did not travel that far and was on his feet (presumably running/staggering/tripping) during the ENTIRE time in which he was in contact with Dubose and Dubose's vehicle. The proof is the framing of the video itself. Tensing's camera was mounted at mid-chest height. During the ENTIRE encounter BEFORE Tensing lost contact with the vehicle, the frame of the video is clearly ABOVE the bottom of the driver side window. This is NOT possible in any situation that involved Tensing being dragged. "Dragged" means you are moving but no longer supporting your body weight on your own feet. You are "hanging" from the vehicle in some way. The "highest" point of the body from which Tensing *could* have been dragged is his armpit. Even if he were being dragged from the armpit (highest point), the camera would have been looking straight into the green door of the car. ALL you would see would be green door. If he were being dragged from the elbow or wrist/hand, the camera would be even lower. In reality, the camera NEVER drops below the window until JUST as Tensing SEPARATES from the vehicle, because the fell OFF of his feet. In order for the camera to have been that high, he MUST have been on his feet.